Everyone who knows me, knows how much I HATE Halloween. It does nothing to honor the Light and Life of my Lord. It does far more to honor the Anti-Christ, pagan gods, fear, and death. With that said, I do love costume parties and face painting. Last night my daughter attended the youth costume party at our church. All the costumes where cute, but there still had to be one...a boy who used makeup to look like a dead person and even made a coffin out of cardboard. This is the reason I do not like costume parties at the church around Halloween time: that element of Halloween ALWAYS comes in. That is all I am going to say on the matter. 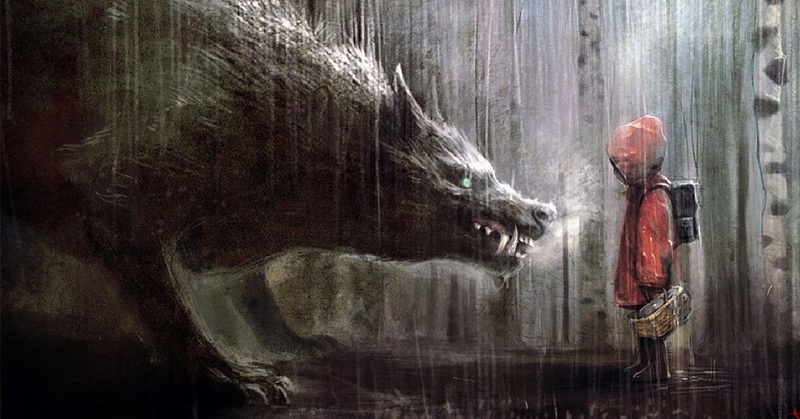 My daughter decided she wanted to be a modern Little Red Riding Hood and was hoping to use Mishka as the wolf, but I thought he was just too undisciplined and just large enough to create havoc at the party. We did not find that long, oversized red hoodie we searched for, but we did find a hooded jacket that she liked at Goodwill. 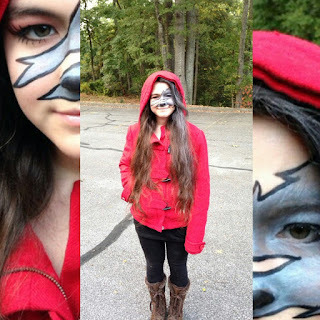 After all that we talked about makeup yesterday, because I know that she does not like looking "sweet and vulnerable," so I came up with some ideas to make her Red Hood -n- Wolf, that would not be frightening or gory or bloody or whatever else that I hate about Halloween costumes and makeup. Perhaps it was skirting the edge, but I just saw it as twist on the a fairy tale and the Princess actually wanted to sit for the face painting, which she has not wanted to do in years. We also silvered her hair on the wolf side. She won third place in the costume contest. Now some people see a scary Fenris about to eat a vulnerable, frightened little girl in a red hooded raincoat, but we have a Fenris, so we decided that if we just turn a bit we can see a pet Fenris, who looks threatening to everyone else, but is smiling and just wanting to play with the little girl he loves and who is smiling at him. Thank you, my Lord, for giving so much to my daughter and help her crave Your Light more and more. I loathe Halloween & it is creeping in here. I am amused though. The ODD one has always been keen but every year, without fail, she has a performance. Thank you Lord!